Youll need to click the lock icon (shown in the red rectangle above) to make changes; as you can see, I have the second option selected. 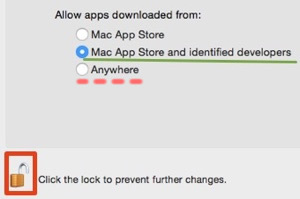 Unlocking requires your administrator password, which is probably the one you log into your computer with. For the 'launcher' software (downloaded from the Student Login page, and based on Adobe 'Director' software) you may need to select the 'Anywhere' button. 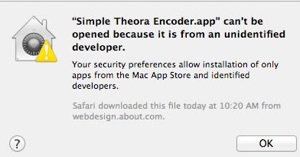 Once you've launched the software for the first time, go back and RESTORE one of the more secure settings above it; having launched an app once, your Mac won't bug you about it again. Click open, and you're off and running!